Wednesday morning we leave for Pittsburgh, where spring International Quilt Market convenes this season. Oliver + S is giving back-to-back presentations as part of the Brewer Schoolhouse series. Join us in room 334 of the David L. Lawrence Convention Center on Thursday starting at 4:45 PM. 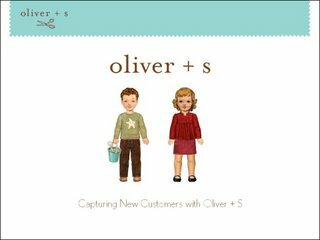 In our first presentation, “Capturing New Customers with Oliver + S,” we will show you how you can use Oliver + S patterns to win the loyalty of a new generation of customers—and keep them for a lifetime. We will discuss the demographic profile of today’s “Dedicated Quilter” and will talk about the emerging generation of customers—customers who may not be shopping at your store today. Come to hear us offer advice on capturing and retaining these new customers and to learn what your shop should be doing to protect itself from the growing number of gray market sellers courting these customers on the Internet. Designer Liesl Gibson will walk you through several current fabric collections, discussing how you can select and merchandise the fabrics you’re probably already carrying to sell Oliver + S patterns (and vice versa). She will also share some success stories from current Oliver + S customers who have seen their fabric sales spike as a result of carrying our patterns. And then don’t miss out on Saturday’s big event. No monster trucks or booming announcer voices to accompany them, but come hang out with Heather Ross and Oliver + S from 2:00 until 4:00 at booth #2442. 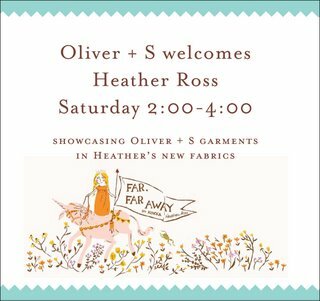 We’ll be displaying outfits made using Heather’s new fabric collection and Oliver + S patterns, and I can almost guarantee some laughs and good times in the process. There may be a few treats as well. Who knows, maybe we’ll even get silly enough to make our own announcer voices? Sounds like such fun. I don’t even have a fabric shop and I’m wishing I could hear your talk. I’ve been courting my local quilt shop to teach a sewing class here or there. They are SO hesitant about carrying garment patterns. I wish they were going to Pittsburgh!!! OOOH! I wish I could go. Sadly, we no longer live out there. But if you drive through New Hope, PA on the way, do me a favor and wave at it for me. We lived there for a few years. Your showcase with Heather’s fabrics and your patterns sounds wonderful! I can’t be there as you know, but you have to promise to fill me in on all the fun chatter, okay? Oh, to be a fly on the wall… well, butterfly would be more like it. I think I saw a dress made from your pattern on the cover of Parents magazine June issue? It’s so adorable!